On November 17, 1812, Brigadier General Alexander Smyth, at a Camp near Buffalo, again issues a Proclamation to inspire his men for the invasion of Upper Canada. 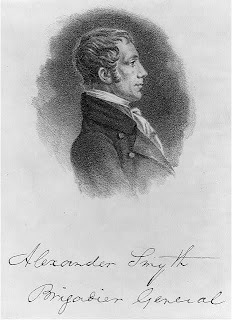 Smyth had been born in Ireland but his family had emigrated to Virginia when he was young. He had replaced General Stephen Van Rensellaer after the loss of the Battle of Queenston Heights, a loss that Smyth had contributed to by not supplying his own forces on the day of battle. Smyth for most of November has been boasting about his planned invasion, which only served to alert the British. Aside from proclamations, Smyth did not carry out the necessary planning and preparation for an invasion to be successful. At various times, his men were in open rebellion against him. Smyth thus has a special place in the long line of incompetent American generals and leaders in the War of 1812. On this day, Smyth's headquarters a Black Rock are also being bombarded by British guns from near Fort Erie. A cannonball, falling into his dining room, interrupts Peter B. Porter's dinner. Smyth's Proclamation is reproduced below. General Smyth to the Soldiers of the Army of the Centre. The time is at hand when you will cross the streams of Niagara to conquer Canada and to secure the peace of the American frontier. You will enter a country that is to be one of the United States. You will arrive among a people who are to become your fellow citizens. It is not against them that we come to make war. It is against that Government which holds them as vassals. You will make this war as little as possible distressful to the Canadian people. If they are peaceable, they are to be secure in their persons and in their property so far as our imperious necessities will allow. Private plundering is absolutely forbidden. Any soldier who quits his ranks to plunder on the field of battle will be punished in the most exemplary manner. But your just rights as soldiers will be maintained; whatever is booty by the usage of war you shall have. All horses belonging to the artillery and cavalry, all waggons and teams in the public service will be sold for the benfit of the captors. Public stores will be secured for the service of the U. States. The Government will, with justice, pay you the value. The horses drawing the light artillery of the enemy are wanted for the service of the U. States. I will order two hundred dollars for each to be paid to the party who may take them. I will also order forty dollars to be paid for the arms and spoils of each savage warrior who shall be killed. Soldiers, you are amply provided for war. You are superior in number to the enemy. Your personal strength and activity are greater. Your weapons are longer. The regular soldiers of the enemy are generally old men, whose best years have been spent in the sickly climate of the West Indies. They will not be able to stand before you when you charge with the bayonet. You have seen Indians such as those hired by the British to murder women and children and kill and scalp the wounded. You have seen their dances and grimaces and heard their yells. Can you fear them? No; you hold them in the utmost contempt. Volunteers: Disloyal and traitorous men have endeavored to dissuade you from your duty. Sometimes they say if you enter Canada you will be held to service for five years. At others they say that if you are wounded the Government will not provide for you by pensions. The just and generous course pursued by the Government towards the volunteers who fought at Tippecanoe furnishes an answer to the last objection. The others are too absurd to require any. Volunteers: I esteem your generous and patriotic motives. You have made sacrifices on the altar of your country. You will not suffer the enemies of your fame to mislead you from the path of duty and honor and deprive you of the esteem of a grateful country. You will shun the eternal infamy that awaits the man who, having come within the sight of the enemy, basely shrinks in the moment of trial. Soldiers of the corps: It is in your power to retrieve the honor of your country and to cover yourselves with glory. Every man who performs a gallant action shall have his name made known to the nation. Rewards and honors await the brave. Infamy and contempt are reserved for cowards. Companions in arms! you come to vanquish a valiant foe. I know the choice you will make. Come on my heroes! And when you attack the enemy's batteries let your rallying word be: "The cannon lost at Detroit or Death." Camp near Buffalo, 17th Nov., 1812.